Thanks to Mike Sivier of the outstanding Vox Political blog for drawing my attention to this. I’ve been snowed under all week and had missed it – and it’s too good to miss. 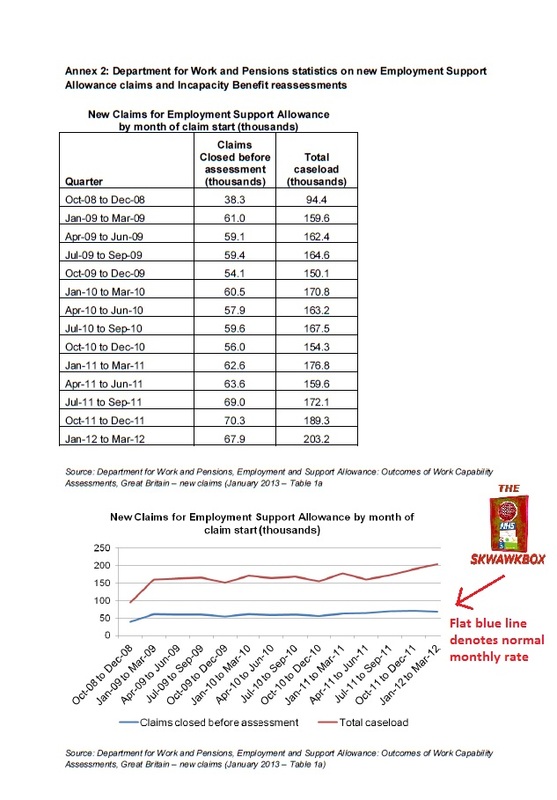 At the beginning of April, I wrote about the Tories’ despicable and clearly intentional abuse of statistics to support their ‘reforms’ and demonise disabled people (yet again) by suggesting that almost 900,000 Employment Support Allowance (ESA) claimants had dropped their claims rather than face medical examination. 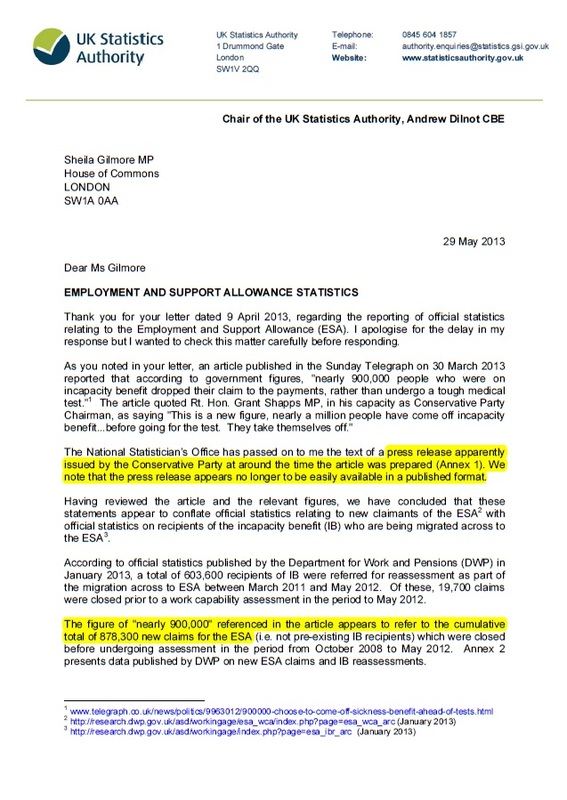 On 11 May, I wrote to Andrew Dilnot, the head of the UK Statistics Authority (UKSA) after his ‘spanking’ of Iain (Duncan) Smith for abusing employment statistics, to ask him to look at the far worse ESA distortion, and invited readers of this blog to do the same, which many did. It turns out a Labour MP, Sheila Gilmore, was ahead of the game. On 9 April, perhaps as a result of reading my initial blog, she wrote to Mr Dilnot to ask him to look into the same matter. Mr Dilnot did so (and I’m certain that the sudden influx of requests from members of the public echoing Ms Gilmore’s request certainly didn’t do anything to reduce his attention on it! ), and sent his response to the MP on Wednesday. this press release ignored a clear caveat in the DWP’s own report that the reason the claims were dropped each month had nothing to do with fear of medical assessment but were because people recovered and went back to work, or else were switched to another benefit deemed more suitable to their circumstances. 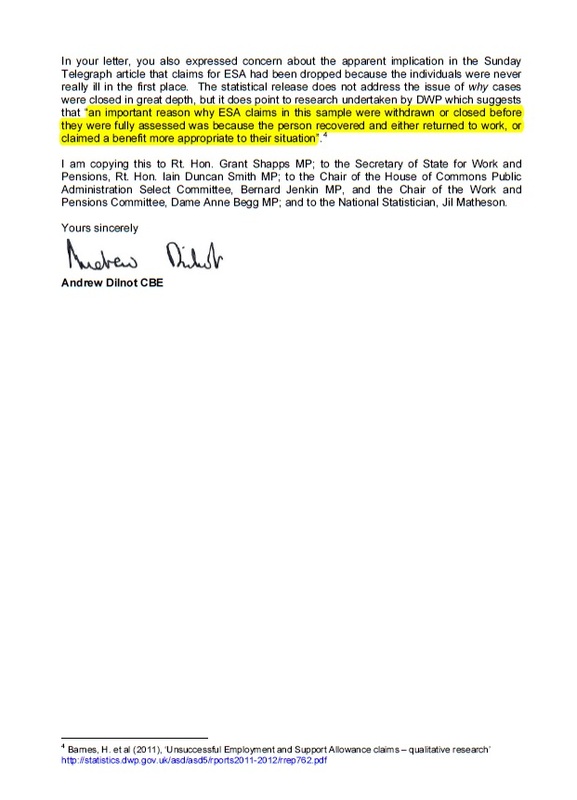 It’s worth reproducing the response letter – which Mr Dilnot copied to Iain (Duncan) Smith, to Grant Shapps, to the Chair of the House of Commons Public Administration Select Committee Bernard Jenkin MP, to the Chair of the Work and Pensions Committee Dame Anne Begg MP and to the National Statistician Jil Matheson, and which was even picked up by the BBC – in full here. 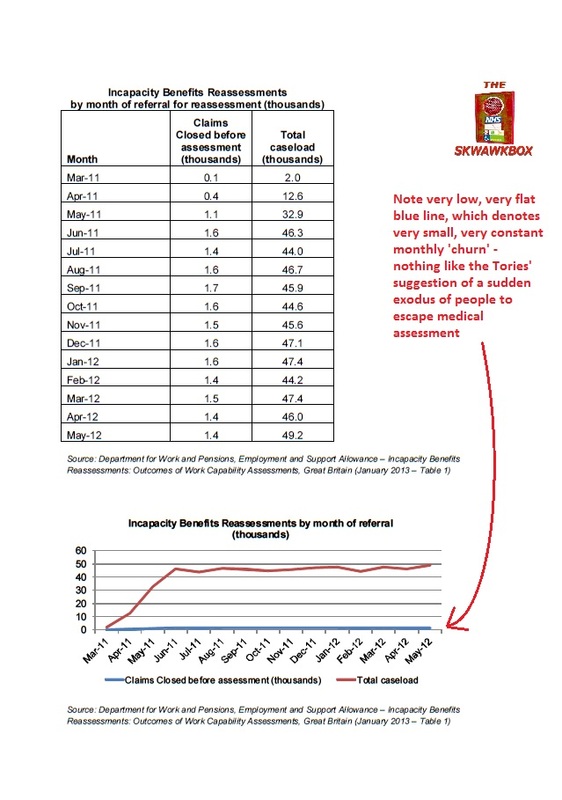 It includes the Tories’ deliberately-misleading press release and two very telling DWP graphs which Mr Dilnot included as an annex. It’s obvious to anyone paying attention that Tory ministers will lie as naturally as breathing if it suits their purposes, and that they have no shame whatever about even the most gratuitous distortion of facts to try to present the inexcusable as necessary – even if it means libelling and demonising hundreds of thousands of disabled people, sometimes with terrible results. But now, thanks to Andrew Dilnot, the UKSA and Sheila Gilmore (and before her Nicola Smith of the TUC) – and to SKWAWBOX readers for their efforts in raising the UKSA’s awareness of the issue – those lies are being exposed, and more importantly condemned, on the record by an official UK authority. I give it about two months before Andrew Dilnot mysteriously finds himself looking for a new job. There appears to be only one thing this bunch of crooks, liars and imbeciles do well, and that’s take petty revenge on their critics. Steve – Well done for exposing these manipulative, divisive and lying charlatans. The question now is how do we challenge them effectively politically. 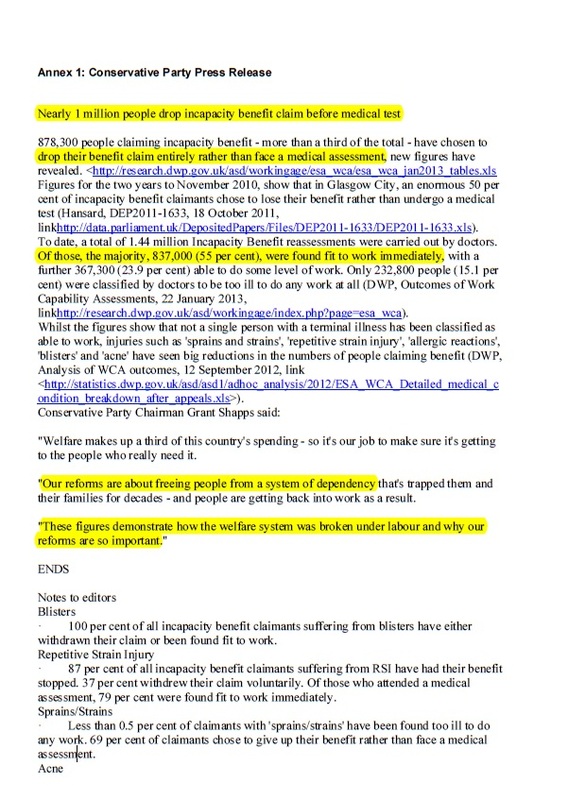 One way may to ask each of your readers to forward your blog to their MP and ask the MP to raise the issue in Parliament and demand answers from IDS and to ask the MP to respond by making it clear that they unreservedly condemn the misuse of statistics to mislead the public and to attack groups of claimants. Any MP failing to condemn the practice could then be exposed in local and national media by your readers seeking support from the electorate to ensure that come 2015 they will actively campaign against their MPs re-election or if they are not standing will campaign against their party, regardless of which Party. Time for decent people to fight back and resist the ongoing demolition of society that is wreaked on all of us by this circus of clowns and spivs. Everyone can get their MPs contact details from “They Work for You” website so emailing them is easy. We all need to work together to make sure our MPs never forget that they really do work for us. We could send you copies of their responses and you could publish their views on your blog. Maybe you could set up a link from your blog to They work for you in the same way that 38Degrees provide an email service to MPs based on your post code. Make it easy for people to communicate. Your investigations and analysis are far more thorough than 38Degrees and I think is all the more powerful because of it. Its very difficult to argue with the reality and analysis of the facts which you have the knack of doing very well. I love that idea. I’ll do a separate post on it shortly. The Conflatertives Party it is now. Well done to all for exposing yet another cluster of lies from them. Obviously I’m as proud of this as Steve Walker is, and would like to see it publicised far and wide. It’s the perfect illustration of what I’m saying about blogs powering the political debate. We should also be pressing for newspapers such as the Telegraph, Mail and Daily Express to acknowledge that the leading articles they published on these subjects were based on lies. We absolutely should! Bit less clear-cut how to do so than with MPs, though. Any ideas I can share? Great work Steve! Keep it up. Further proof that the political powers that be are lying through their back teeth to further their agenda. From a prime minister who doesn’t know the difference between debt and deficit, to ministers intentionally misrepresenting incapacity statistics. It’s time for change. IDS has a lot of explaining to do when he appears before the Select Committee. This is more than just lying because its done with a very specific political agenda. I wonder what LibDem ministers have to say about it. Do they really want to associate themselves with this despicable demonising of vulnerable people who don’t have the power of certain sections of the press to speak up for them? Nice work, Steve.